I sang in a concert this afternoon, and we got home about 6:15 or 6:20 PM, which was very shortly before the eclipse peak. It was already darker than usual; the house was dark, which is very rare at that hour in May. 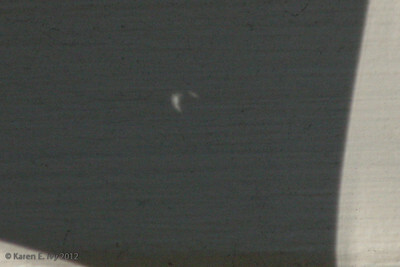 The eclipse maximum was visible in California at 6:33 PM. 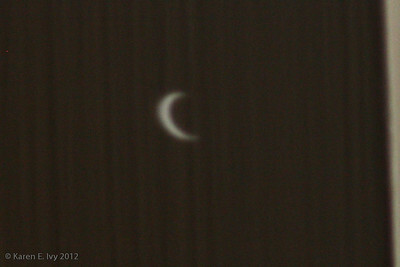 Northern California wasn't in the small geographic path that saw the "ring of fire" in today's partial solar eclipse. 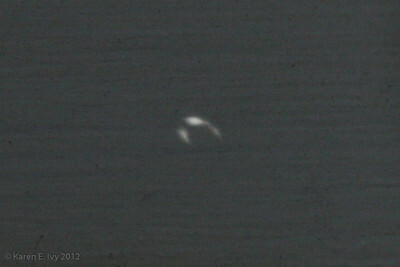 And unlike my friend Blake, I don't have a telescope with a solar filter, nor do I have welder's glasses. I found an advertising postcard and poked a hole in it with a paper clip, to get a pinhole camera image on a flat surface that I could photograph with my telephoto lens. When I went over to the neighbor's house, I borrowed some of the old film negatives they were using, 3 at a time, as a filter, but I thought my best pinhole images gave a clearer view than what I could see there, and of course I couldn't photograph through them. 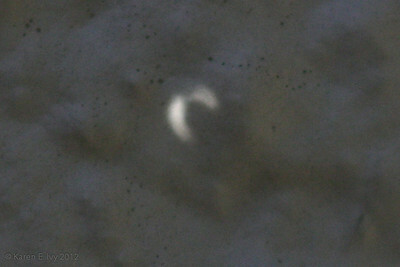 Hm, note to self: solar filter for camera?? 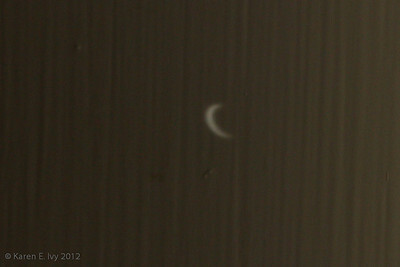 And here are the later shots taken against the neighbor's wall, taken at 6:31, 6:32, and 6:33, respectively. After that, the sun dropped below the trees on the canyon wall, so we all gave up and went in to dinner. I still haven't seen a full solar eclipse.